At a time when some companies don't have a prayer, shoppers are singing praises for Forever 21. The LA-based company, one of 10 businesses featured in Minyanville.com's "Gods of Retail," was founded by Don Chang and his wife Jin in 1984. They just opened a new store in Salinas' Northridge Mall. Forever 21's first store in Japan is scheduled to open next month. The company plans to roll out a plus-size line called Faith 21. What's the secret? Minyanville.com looks on the bottom of the store's shopping bag for answers. 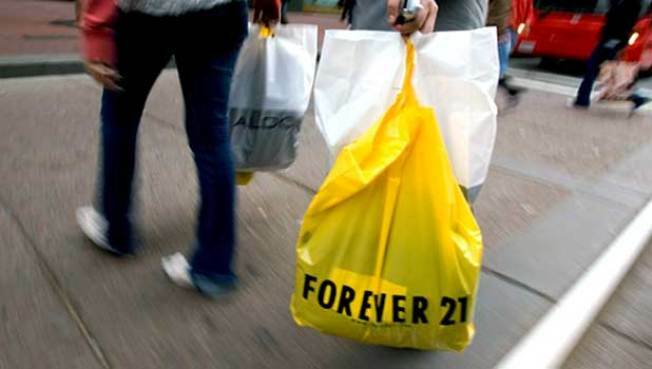 F21 bags are emblazoned with John 3:16: "For God so loved the world that he gave his one and only Son, that whoever believes in him shall not perish but have eternal life." "It's a very unusual approach, and most marketers steer clear of religion," said Tim Calkins, a marketing professor at Northwestern University’s Kellogg School of Management in an interview. "For many marketers, it's a third rail. The downside is substantial because religion is often very polarizing." The "Third Rail" of marketing might be keeping Forever 21 on track during the economic downturn. Or maybe it's the runway styles at bargain prices. Either way, it's easy to find religion -- just look on the bottom of that fast-food restaurant cup. Minyanville.com lists nine other companies that are on a mission. Some of the references are hidden: the bottom of In-N-Out Burger cups have John 3:16 printed inside the rim. Other connections are on the nose: You can't eat one of Chick-fil-A's hand-breaded chicken sandwiches on Sundays. They're closed.